“What is amazing about the Summit is it is a showcase in the power of possibility,” said Sara Kaner, No Barriers Summit director. “Attendees are able to immerse themselves in recreation, innovation and entertainment that are fully accessible for any ability. We are one of the only immersive events in the country that makes it possible for all people to participate. Join us for an evening of inspiration or come for the entire event”. 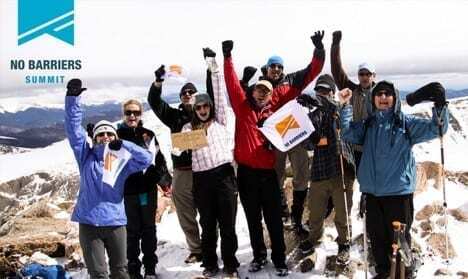 Local companies participating in the Summit include Achieve Tahoe, which will lead a session in adaptive water skiing, plus a canoe, kayak and paddleboard excursion on Prosser Reservoir and a full-day water excursion including skiing, boat tubing and paddle sports, No Limits, which will provide an accessible climbing wall and lead a rock climbing clinic, High Fives Foundation which will stage a wheelchair rugby match and Note-able Music Therapy, a Reno-based company that will lead the dance and drum circle activities. Early-bird Summit registration before May 25, 2017 is $350 and includes all meals (except a cash-only community dinner on Saturday night), access to speaking sessions and community events, plus admission to the innovation pavilion. Elective activities are an additional fee. Visit http://www.nobarriersusa.org/summit/2017-summit-activities/.for a full list. Also, evening passes to speaking events are available for visitors who are curious about living a No Barriers Life but aren’t ready to commit to a full weekend of immersion.